NOTIFICATION: Uttar Pradesh Subordinate Service Selection Commission (UPSSSC) Lucknow inviting online applications for filling up 115 vacant posts of Junior Assistants in various Departments from eligible and interested willing candidates. It is latest & good information for unemployed personnel those who are looking for these new Jobs in Government sector & other organizations. Job seekers, who wish to apply for these vacancies regarding Recruitment 2017, must have passed Intermediate or its equivalent Exam with a required experience if asked. Applicant’s upper age should be as per Govt rules and age relaxation is applicable to all reserved category candidates i.e.SC/ST /OBC /PWH/Ex Servicemen/Women candidates etc. 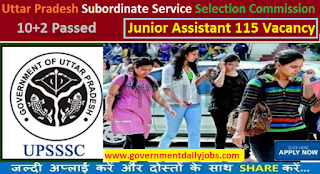 NO OF POSTS: 115 vacant posts of Junior Assistants through Uttar Pradesh Subordinate Service Selection Commission (UPSSSC) Lucknow. 3. Other Backward Classes: 43 Posts. 101 vacant posts of Specialist Officers (SO) at its different Branches and Offices in various disciplines in Industrial Development Bank of India (IDBI). LAST DATE TO APPLY: 20-02-2017. REQUIRED QUALIFICATION: A passed of Intermediate or its equivalent from any recognized Board/Institute and DOEACC certificate or equivalent and typing speed in Hindi and English 25 & 30 wpm on Computer. PAY SCALE: Rs. 5200 – Rs. 20200/-+Grade Pay Rs. 2000/- for UPSSSC Junior Assistant Recruitment 2017 for 115 Jobs. REQUIRED AGE: Candidate’s required age should be in between of 18 years - 40 years as on 01-07-2017 for UPSSSC Junior Assistant Recruitment 2017 for 115 Jobs. REQUIRED APPLICATION FEE: For said vacancy a non refundable application fee is to be paid by the candidates as per rules. An amount of Rs.185/-by General & OBC category, Rs.95/- by SC/ST category candidates and Rs.25/- by PWD category candidates to be paid through SBI -E-collect only up to 09-02-2017. SELECTION PROCESS: Applicants who are screened for applicability/ eligibility are being selected as per organization policy/rules depending on the basis of their performance in Written Test, Typing test & Interview. 1. Written Exam: 40 Marks. 2. Computer Typing Test (Qualifying Nature). 3. Academic Merits: 30 Marks. 4. Sports Merits: 05 Marks. 5. Personal Interview: 25 Marks. Total Marks of Selection Process (40+30+05+25): 100 Marks. HOW TO APPLY: For said posts (UPSSSC Junior Assistant Recruitment 2017 for 115 Jobs) eligible, willing and interested candidates may apply through online at official website up to 07-02-2017 for Part 1 and 11-02-2017 for Part 2 registration. Applicants must retain a hard copy for future reference. 2. Find out Notifications/Advertisements section and select it to go to respective webpage. 3. Navigate to Direct Recruitment Advt No. 01-Exam (S.S)/2017. 4. Click on View Advertisement to download Official Notification as PDF file. 5. Read whole Notification carefully to know all rules of recruitment. 6. Return to previous page and checkout User Instructions. 7. Select Apply link to expand the recruitment tab. 8. Click on Candidate Registration to proceed. 9. Fill up Online Application Form with necessary personal and educational details. 10. Upload your recent passport size photo and signature as asked. 11. Proceed to generate Fee Challan and take printout of it. 12. Pay the Application Fee as per instructions. 13. Again visit the official website and enter your Fee details. 14. Submit the Application Form online on completion of all formalities. 15. Save your Application Registration Number for future reference. 16. Get printout of Application Form for future reference. CONTACT ADDRESS: Uttar Pradesh Subordinate Service Selection Commission (UPSSSC) Lucknow. CONCLUSION: Uttar Pradesh Subordinate Service Selection Commission (UPSSSC) Lucknow invites online application for the recruitment of 115 vacant posts of Junior Assistants on regular basis from Indian residents who are eligible & interested; candidates can apply through online application up to 11-02-2017. 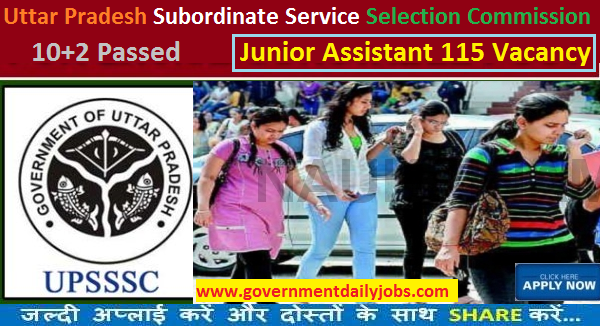 LAST DATE TO APPLY: 11-02-2017 for UPSSSC Junior Assistant Recruitment 2017 for 115 Jobs.